Alice + Freda Forever, by Alexis Coe: So, so interested in this. Just Mercy, by Bryan Stevenson: Shannon at River City Reading had lots to say about this one, which has it immediately added to my list. Add to that the fact that it seems to blend with my own reading list on poverty in the United States--something that can rarely, if ever, be entirely removed from our justice system--and I am all over it. The Good Girls Revolt, by Lynn Povich: Florinda at the 3 R's Blog pulled this nonfiction review out of her archives, and boy am I glad she did. The story of how 46 Newsweek women filed an EEOC complaint for systematic discrimination against them in the workplace sounds so important (I'd never even heard of the case!) and relevant to our continued discussions about feminism and equality. Pro, by Katha Pollitt: Another shout-out to Shannon of River City Reading for this one, which she called the best piece of nonfiction she'd read this year at the start of Nonfiction November. That's enough for me, but combined with the subject matter (the subtitle is "Reclaiming Abortion Rights"), I just can't resist. The Crimes of Paris, by Dorothy and Thomas Hoobler: Trish at Love, Laughter and a Touch of Insanity noted that despite the clunkiness of some of this book, the subject matter--crimes in Paris, of course--was fascinating enough to make it worth it. I'm learning how much I love true crime (and I'm always fascinated by Parisian history), so this went on the list. The Restless Sleep, by Stacy Horn: Kim at Sophisticated Dorkiness nominated this one for a Nonfiction November readalong that I promptly signed up for and then didn't participate in. I'd never heard of the book before, but I have it from the library waiting for me to read just as soon as I get some reading motivation. Lives in Ruins, by Marilyn Johnson: Leah at Books Speak Volumes reviewed this one, and I love finding books on compelling but slightly obscure subjects that don't usually find a spotlight--like archaeology. 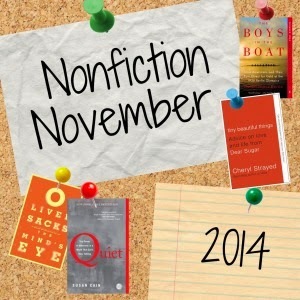 What books did you discover during Nonfiction November? Or what books did I not discover that I should have? November is usually one of my favorite months for reading. Because December tends to be such a light publishing month, I'm off the hook for most (not all, but most) of my review commitments, because those are usually due to my editor a month before pub date. Which means November can be backlist or frontlist or nextyearlist or whatever I want it to be. Except this year, "whatever I want it to be" is apparently incompatible with "what my brain is capable of focusing on." I've read twelve graphic novels this month (the second half of the Y: The Last Man series by Brian K. Vaughan and all of Sweet Tooth by Jeff Lemire), and watched two full seasons of Gilmore Girls. I reviewed a few cookbooks for Shelf Awareness for Readers (really good cookbooks, too, like The Cook's Illustrated Meat Book, which, let me tell you, will make a carnivore of us all). I sloooooooowly managed to finish The Working Poor, a book about the working poor in the United States, which, while not exactly uplifting, was at least eye-opening. And that, my friends, is it. My big month of read-what-I-like has turned into a slump month of read-very-little. The slump has also carried over into my writing, which is why my Nonfiction November posts have been up late (if at all--I missed this week's entirely), I haven't submitted to Bloggers Recommend (I forgot until this morning... deadline is the 20th), and the blog has been rather quiet overall. I'm picking up a re-read of The Bone Season next (to prepare for the January release of the second book in the series, The Mime Order), and planning to read The Princess Bride over Thanksgiving (to complement my recent read of As You Wish, Cary Elwes' tell-all about the making of the movie). Perhaps one or both of these will kick me out of this slump in which I find myself--or perhaps not. If the former, huzzah! If the latter, I expect I'll be catching up on Blacklist and more Gilmore Girls and generally enjoying whatever is hitting the spot, as it were. And I guess that's ok, too. We've all heard it, or some variation of it: "I don't give homeless people money because they should just get a job." What statements like this fail to acknowledge, however, is eternally complex question of the root causes of poverty; it is, unfortunately, no guarantee that a job will prevent you from being homeless, any more than it is a guarantee that being homeless means you have no job. The Short and Tragic Life of Robert Peace, by Jeffrey Hobbs: Hobbs wrote this biography of his college roommate, Robert Peace, after Peace was murdered in the basement of a house in Newark, New Jersey, where he was working as a drug dealer after graduating from Yale with honors. Hobbs exploration of his friend's life is at once an attempt to understand how this young man, so seemingly poised for success despite overwhelming odds, ended up back where he started, as well as a study of the power of poverty in the United States today. Seriously, incredibly eye-opening. Full review. Nickel and Dimed, by Barbara Ehrenreich: Ehrenreich went "undercover" in 1998 to see what life was really like for those American workers putting in full-time hours (often more-than) in the "unskilled" jobs of our country. She worked at Walmart, she cleaned hotel rooms, she waited tables. She made readers reconsider how their everyday amenities--big box stores, hotel stays, the food on their tables--came to be, and nearly 20 years later, the book is just as important as it was in 1998. Which is saying something about how far--or not--the world of American poverty has come in the last 16 years, isn't it? The Working Poor, by David K. Shipler: Shipler's book is similar to Ehrenreich's in that it explores not the most destitute, but those hovering just around the poverty line while working as hard as possible to make ends meet. I'm halfway through this one, and while some of the facts seem like they should be obvious, Shipler's support of assumptions with numbers and data and anecdotal evidence really brings things home. Fire in the Ashes, by Jonathan Kozol: Subtitled "Twenty-Five Years Among the Poorest Children in America", Kozol's newest book returns to the children he wrote about in Rachel and Her Children and Amazing Grace to share their "journeys and unexpected victories as they grow into adulthood." Hand to Mouth: Living in Boostrap America, by Linda Tirado: I'm not even going to try to summarize this one, I'm just going to give you the jacket copy: "We in America have certain fixed ideas of what it means to be poor. Poor people live in shelters. They are on welfare. They go to soup kitchens. To some, poor people are lazy. And even the most enlightened of liberals have wondered aloud, 'Why do poor people make such bad choices?' Linda Tirado, in her signature frank yet personable voice, takes these preconceived notions of what it's like to be poor and smashes them to bits." Rosa Lee: A Mother and Her Family in Urban America, by Leon Dash: The story of Rosa Lee, a woman falling deeper and deeper into poverty in Washington, D.C. The book is based on a series of Washington Post articles that ran beginning in September of 1994, and though the title is less well-known today than others (Nickel and Dimed) of the same decade, I'm very much intrigued. Interestingly, most of the books about poverty that have come across my radar are a) written by white people (even though poverty disproportionately impacts non-white people in the United States (in 2012, the overall poverty rate in the US was 15%; for Whites, 9.7%; for Blacks, 27.2%; for Asians, 11.7%; for Hispanics (of any race), 25.6%))*, and b) are written from an outsider's perspective (even when said outsider is embedded deep within a group, as in Ehrenreich's case). If anyone has suggestions for books that address the potential one-sidedness of this list, I'd love to hear them! In the meantime, rest assured that I'll be a-Googling this. This post is part of Nonfiction November's week 2 theme: Be/Become/Ask the Expert on a subject. But my favorite of the year so far? The Short and Tragic Life of Robert Peace, a book I haven't yet spent much time discussing because it has taken me the last few months to truly process the powerful story within its pages. Jeffrey Hobbs' biography of Robert Peace, his college roommate, is heartfelt and powerful, well-researched and well-written, and reveals not only a life, as all biographies due, but the context in which that life was lived, which only the best biographies accomplish. I barely scratched the surface of this in my full review, but the story of Peace's short, and indeed tragic, life has stayed with me for month after month. Interesting, my favorite nonfiction read of the year has not been the one I've recommended the most. That title falls to either Hotel on the Place Vendome, which tells a story of World War I and World War II history through the narrow lens of the Hotel Ritz in Paris, or Bad Feminist, Roxane Gay's amazing and inspiring collection of personal essays on everything from race to sexuality to Scrabble. Though I've read several memoirs and a few history books this year, The Short and Tragic Life of Robert Peace marked the only true biography in my list--and given how much I loved the biographical approach to learning about a subject (in this case, poverty in America) and a time period, I wish I explored more biographical histories in my nonfiction reading. 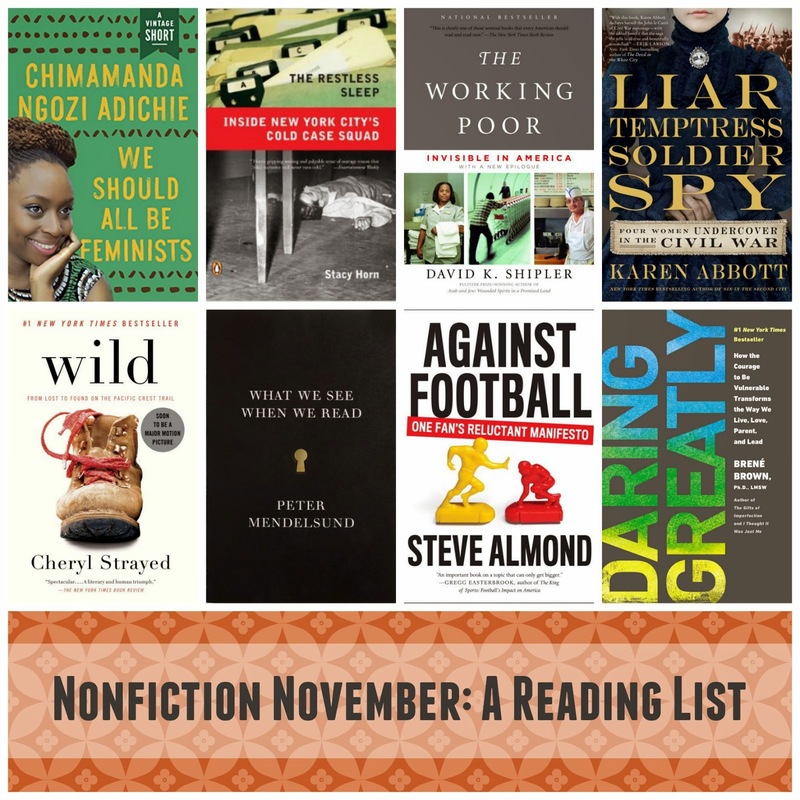 Which brings me to this year's Nonfiction November, kicking off this week (and thanks to Kim at Sophisticated Dorkiness for hosting this week!). Because my nonfiction reading has been so low overall, my only goal for the month is to make a concerted effort to read more of the nonfiction on my list. My curious mind wants to know, as I dive into Nonfiction November, what your favorite nonfiction reads of the year have been? The Star Wars franchise is no small thing, with an estimated 1.3 billion tickets sold to the six theatrically released movies worldwide, $6 billion in VHS/DVD sales and $20 billion in merchandise sales. But how did it grow from the impossible dream of a young filmmaker to a multibillion-dollar franchise? 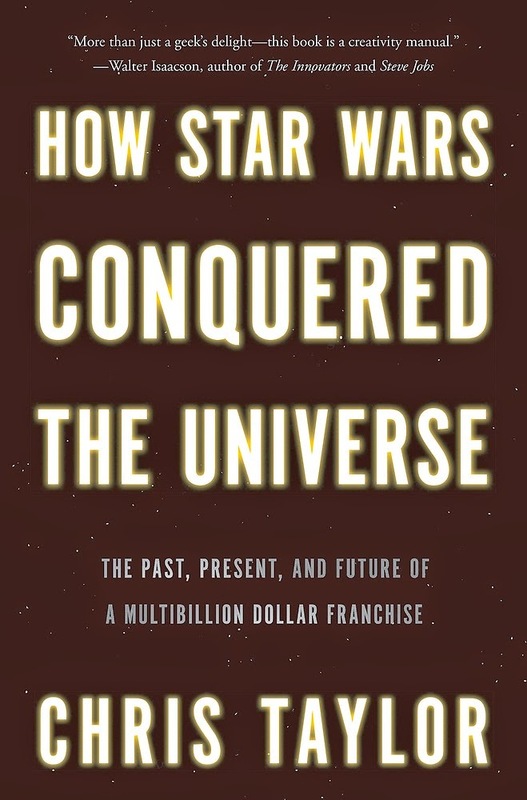 Journalist Chris Taylor answers that question in How Star Wars Conquered the Universe, which covers not only the "past, present and future" of what might be the world's most ubiquitous franchise, but also how it has made an impact on--and been influenced by--its ever-growing fan base. Taylor weaves George Lucas's biography with a history of science fiction and space fantasy in print and on screen, which he then fits into an exploration of Lucas's creative approach to each of the six films and the timely political undertones in each story. He then turns to the Expanded Universe (the body of Star Wars books, games, TV shows and other sanctioned stories) and how it interacts with Lucas's big-screen creations. Taylor doesn's shy away from criticisms of Lucasfilm or the movies themselves, such as flaws in the plotlines or tensions on the film sets. But at its heart, How Star Wars Conquered the Universe is a love letter to a franchise that has become entrenched in contemporary culture in more ways than we could possibly count (just think how difficult it would be to find someone, anyone, who does not know the identity of Luke's father), and a testament to the power of space fantasy to capture our imaginations. As You Wish, by Cary Elwes: Ok, I cheated here, because this is an October book, but as I'm halfway through the audio version (read by Cary Elwes, with appearances from Robin Wright, Christopher Guest, and other cast members), I'm sneaking it in anyway. Because HOW COULD YOU NOT LOVE A BOOK ABOUT THE MAKING OF THE PRINCESS BRIDE? GB84, by David Peace (Melville House, November 4): I had never heard of Peace before BEA this year, when I heard him read from Red or Dead. And though I still haven't started that (or The Damned UTD, which I own), I'm already jonesing to dive into GB84, historical fiction that the blurb promises "depicts a real-life 1984 more violently dystopian than even Orwell imagined." Um, yes. In the Company of Sherlock Holmes, edited by Leslie Klinger and Laurie King (Pegasus, November 28): I read (and adored) Klinger and King's first Sherlock-inspired collection, A Study in Sherlock, so you can bet I was jumping up and down all over the place when I saw there was a second volume in the works. I've already read it, and I can tell you it's just as delightful as the first collection, so gear up for some wildly inventive Holmes-inspired fiction, friends. Information Doesn't Want to Be Free, by Cory Doctorow (McSweeney's, November 18): Who here thought it was impossible to make copyright interesting? Right. All of you raising your hands have just been proven wrong by the inimitable Cory Doctorow, whose exploration of copyright law and how it affects art and artists and the market and our everyday lives is just downright fascinating. The Art of Asking, by Amanda Palmer (Grand Central, November 11): Palmer is a fascinating artist to watch, and actually appears on this list of books twice, in her way (she wrote one of two introductions to Doctorow's book, above). I don't know much about this book yet, but coming from her, I know it will be interesting. See You In Paradise, by J. Robert Lennon (Graywolf, November 3): I nabbed a copy of See You in Paradise, a collection of short stories by an author Ann Patchett calls "a writer with enough electricity to light up the country," the same way I found The Wilds: at Book Expo, by asking the staff at the Graywolf booth what one book I should walk away with given my limited suitcase space. This was that book, and the stories are weird and strange and delicious and memorable, and, just as Patchett said they would be, electric. Read this if you love short stories, or if you think you'll never love short stories. The World Split Open, an anthology (Tin House, November 11): I said in my wrap-up of October books that I would read anything with Margaret Atwood's name on it, even an IKEA catalog, and that's what brought me to this title. 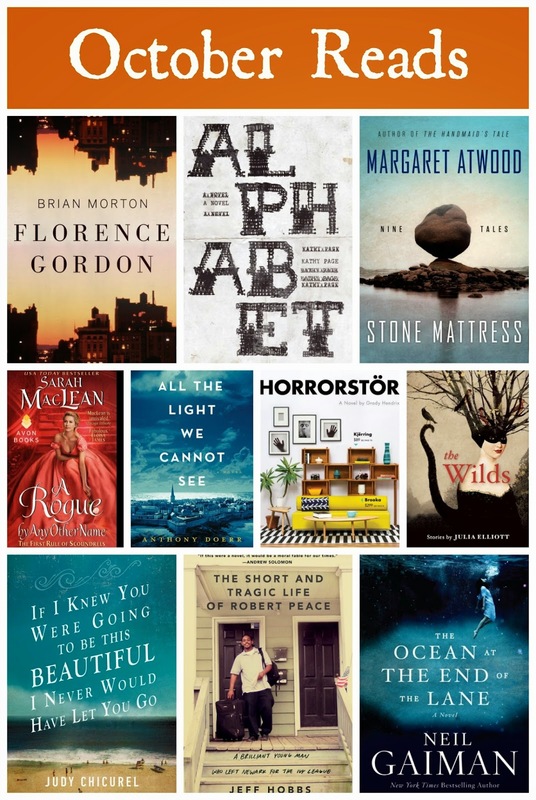 But Atwood's not alone in this collection, subtitled "Great Writers on How and Why We Write." Other authors include: E. L. Doctorow (author of Ragtime, among others); Marilynne Robinson (Gilead ranks among my favorite books of all times); Ursula K. Le Guin (a fantasy author I've always meant to read but never quite got around to); and many others. *Though remember, nothing lasts forever in a cold November rain. November is truly and fully upon us on the East Coast (translation: we've reset our clocks and it is chilly out there), and with it comes Nonfiction November. I've never gotten my act together to participate in this event before, but I'm looking forward to it this year--especially because November tends to be a slower month for me in terms of review obligations (there aren't many books with December pub dates). So, though I'm sure I'll deviate from this list, some books I'm considering for Nonfiction November. 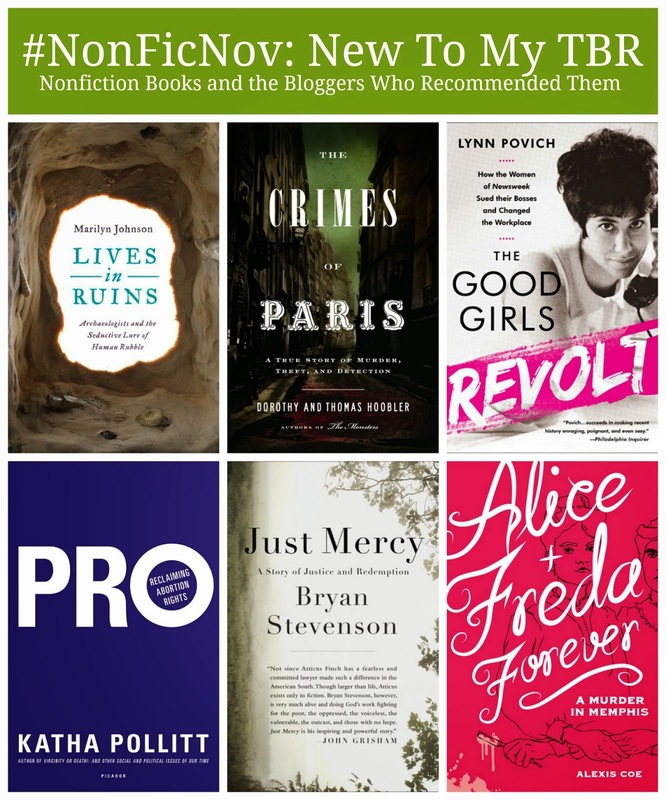 With kudos to Shannon for providing a) an amazing list of non-fiction by women, which plumped up my TBR list considerably, and b) a guide to scanning Edelweiss for non-fiction titles, which helped me discover new titles without getting bogged down in academia. The Working Poor, by David Shipler: I changed careers this summer, leaving the world of ad men behind in favor of a position with a small charitable foundation, where I oversee our grants process. It's the first time I've ever been able to say, hands down, "I love my job," and this book is evidence of that: it's technically work research, but I'm actually enjoying it. Daring Greatly, by Brene Brown: This is another that technically falls in the category of could-be-for-work, but after hearing so many other bloggers loving on it, I figured I should see for myself how great it is. Liar, Temptress, Soldier, Spy, by Karen Abbot: This book (which sounds fascinating in its own right, especially for those history lovers among us) sparked an interesting discussion about women writing non-fiction. It was on my list to read before that, and now it's even higher up. Plus, girl power + Civil War history + spies = probably awesome, right? Wild, by Cheryl Strayed: I will just keep putting this on every reading challenge list it possibly fits on and eventually I'll pick it up... my only hesitation has been fear of disappointment, because I have so much love for Tiny Beautiful Things that I don't want to accidentally knock Strayed off of the pedestal on which I've placed her. The Restless Sleep, by Stacy Horn: One I'd never even heard of until I saw that Kim at Sophisticated Dorkiness (one of the hosts of Nonfiction November) is hosting a readalong of this one in honor of th month-long challenge. A deep dive into the cold-case squad in New York City. What We See When We Read, by Peter Mendelsund: With promises to explore how our minds process what we read, how could I not fall in book love? We Should All be Feminists, by Chimamanda Ngoza Adichie: One of the books in the new Vintage Shorts series, this is a sleight book but one that's been chilling on my e-reader since its publication this summer. I think the title just about says it all, right? Against Football, by Stephen Almond: In years past, I've gotten more and more into football as I learned to understand the rules and the calls and the art of the gameplay. But recently, I've become totally disillusioned with the sport, between the possibilities of long-term brain injury players face every day, the horrors of abuse seen in the NFL, and the way the "machine" around the sport handles every controversy that arises. So Stephen Almond's book against that very sport, subtitled "A Reluctant Manifesto," seems liked timely reading for one fan on the fence. What nonfiction are you excited for?